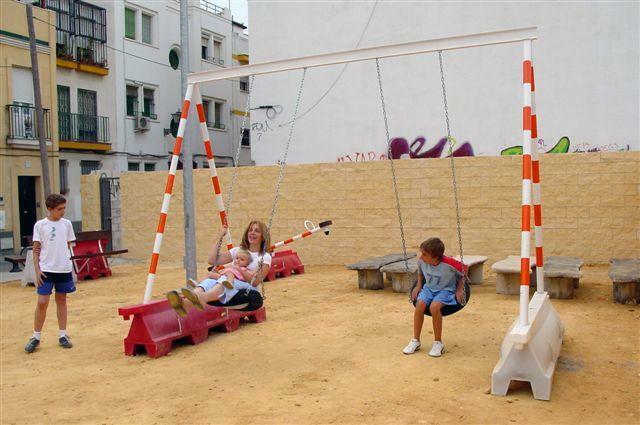 A proposal made to the city of Seville for legislation to assist in the temporary transformation of public and private solares – vacant lots walled off for security – into public spaces for at least six months. Wall rubble is incorporated into the design, and elements of car and pedestrian barriers are used to construct benches, see-saws, swings, and bike racks with readily available plastic materials like concrete. Instruction sheets were produced to allow residents to construct their own furniture. The project is designed to minimize material movement, cost, and other barriers to change. Santiago Cirugeda is an architect based in Seville who has proposed semi-legal strategies for housing and urban renovation under the name Recetas Urbanas, or “urban prescriptions,” since 1996. He inhabits gaps between laws, exploiting overlap and oversight to practice autonomous architecture.